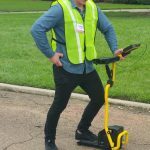 ULTRA-TRAC® APL – Utility Mapping Services, Inc. The ULTRA-TRAC® APL Acoustic Pipe Locator finds plastic pipe and systems with missing or broken tracer wire. Natural gas pipelines, water and sewer laterals are easily traced using state-of-the-art acoustic technology. APL features an integrated tablet which allows the user to view scan data and 3D images of the surveyed underground area. The APL’s on-board software now features improved gain correction to eliminate false-positives. APL will significantly reduce the number of unlocatable pipes and identify potential cross bore risk locations when using HDD.